Renown Health’s recent partnership with 23andMe and the Desert Research Institute has been an astounding success. Just little over a month ago we announced the program which offered free personalized health and ancestry information to over 5,000 Northern Nevadans. We expected it would take two days to get that many people to sign up. You can imagine our surprise when the day after the launch of the event, all 5,000 slots has been filled up! So we decided to open up another 5,000 slots, which filled almost equally as fast. Some reasons to which the success of this event could be owed would be the cost (it’s one hundred percent free for participants), the perks of genetic analysis (it’s something that many people are curious about, but would not think of paying for), and the simplicity of our system (all that is required is that participants show up, watch an informational video about the project, sign some forms, and spit into a tube). There’s also the additional incentive of knowing that those who participate are contributing to the overall benefit of the Nevada community. 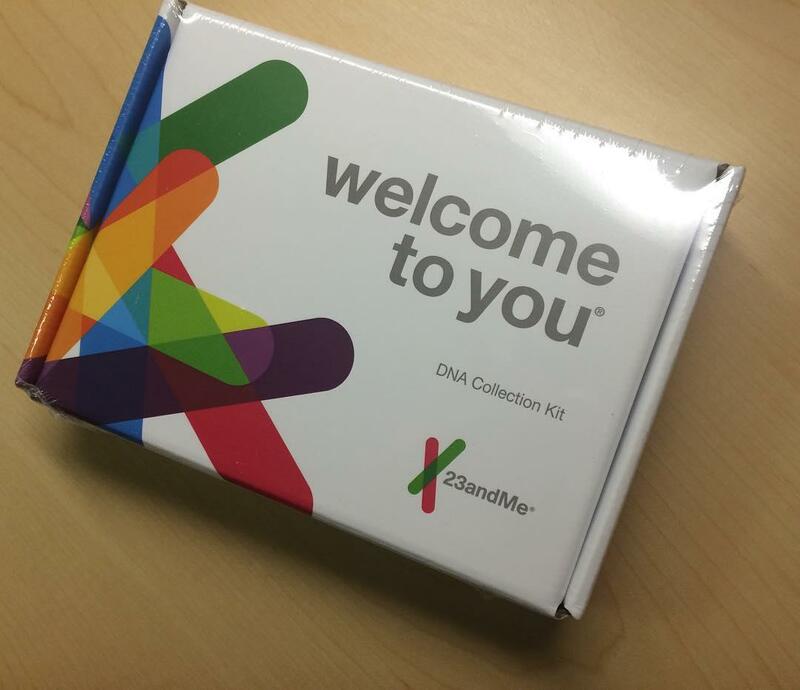 Through our work with 23andMe, Renown Health now has access to over 10,000 samples of genetic analysis. By combining this data with our data on the medical histories of over 300,000 people, we will have a better overall picture of the health of those in Northern Nevada. The Desert Research Institute will draw even more insights out of this data by looking at it in conjunction with a number of social and environmental figures. The overall goal of all of this data-crunching is to figure out how different environmental, demographic, and environment factors interact. Once we have a better idea of this, we will be able to better allocate resources to those who need them most and may even be able to stop illness before it happens. This data-gathering, data analysis, data sharing, and all around cross-organization collaboration truly epitomizes what population health can become. I’m very proud of everyone who has been involved in this initiative–from the participants, to the researchers, to the countless administrative workers who have made this possible. Additionally, this project would not be possible without the generous support of Governor Brian Sandoval and the rest of the government of Nevada. I’m also taken aback at how warmly the community has received this project. For instance, KUNR gave Joe Grzymski of 23andMe a great interview and the Reno Gazette-Journal has provided us with some glowing press. We’re taking steps toward the future of medicine. One date marked on the calendar of many individuals at the management level of health organizations is January 1, 2017. To some 2017 is being viewed as a “year of reckoning“. Although this sounds ominous, most negative effects on health organizations can be easily avoided as long as providers are prepared for MACRA. Since 2015, MACRA has been slowly integrated into the operations of medial organizations across the country. In 2017, the performance of medical organizations that qualify as MIPS will be tracked and these results will determine how providers are paid in 2019. This may sound a bit confusing. It sounds like money’s on the line. It sounds like big changes are coming. But what exactly does MACRA mean and what exactly is a MIPS? To answer these questions I’ve put together a brief starter guide to MACRA and what it means for the healthcare industry. In a nutshell, MACRA is new set of rules and regulations that will reshape the way that medical organizations receive government funding, handle Medicare, and ultimately function. The government MACRA with bi-partisan support back in 2015. Given that MACRA is such a large overhaul of the healthcare system, adoption to the rules and regulations of MACRA has been generously spaced out over a timeline of many years. In brief, MACRA will change how Medicare pays medical providers. Yes, but what does MACRA stand for? MACRA stands for Medicare Acccess and CHIP Reauthorization Act of 2015. And what does CHIP stand for? Children’s Health Insurance Program. Basically the program that provides states with matching federal health insurance funds for families with children. How will performance be tracked? That depends. There are three different classifications of medical payment models: MIPS, APMs, and e-APMs. You bet. MIPS (or Merit Based Incentive Payment Systems) will effect the majority of providers. APMs (or Alternative Payment Models) are a bit trickier to qualify for. 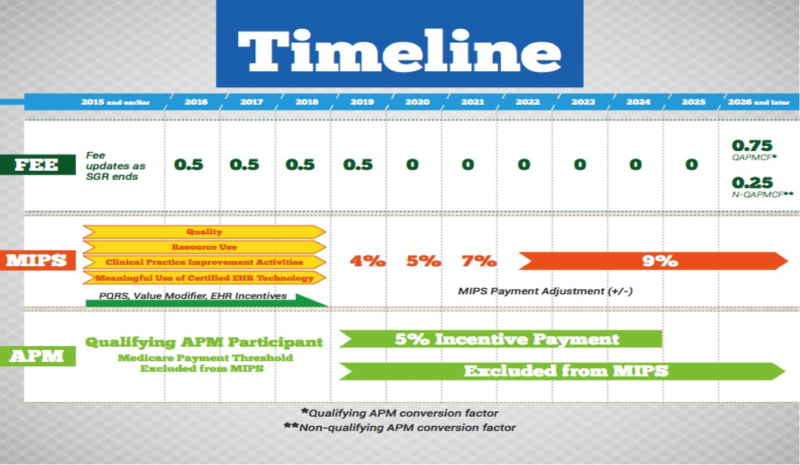 E-APMs (eligible alternative payment models) are basically a subset of APMs. APMs are still subject to MIPS, but will receive favorable scoring, with reimbursement rates that reflect accordingly. Just like a building might need to reach certain benchmarks in order to be certified as LEED or an Olympic diver has to be mindful of technique and style in order to win a higher score from the judges, so will medical organizations need to meet certain benchmarks in order to receive more favorable payment rates. That means that medical organizations will need to make sure they are reaching to achieve a slew of metrics pulled from PQRS (Physician Quality Reporting System), EHR (Electronic Health Record), and the VM (Value-Based Payment Modifier) outlined in MACRA’s performance measures. So what happens once all of these measures are taken into account? Based on how an organization meets these metrics, they will be given a MIPS composite score that is either positive, negative or neutral. Each of these will adjust the base rate of a provider’s Medicare Part B Payment, which is money that an organization qualifies to receive from the government when a patient uses Medicare for services covered under Part B. And these incentives really do add up. Larger medical organizations stand to lose or gain 15 to 20 million bucks depending on whether or not they receive favorable scores. So if hypothetically a lot of identical organizations are performing well, will they all get the same amount of money? Not exactly. This system will be budget neutral. That there’s a fixed pool of money available for medical organizations. Those with higher scores will in effect take away money from medical organizations that perform more poorly. Admittedly, MACRA does pose some big challenges for the healthcare industry, but the overall goal is something that we could all agree on: better value and better outcomes for patients. The thing is, the healthcare industry is heading in that direction anyway. There are so many medical organizations out there right now that it’s less a matter of if someone can get to a healthcare provider, it’s which one should they go to. In order to stay in business, providers need to step up their game and really show patients that they value them. So why is MACRA being introduced if we’re already seeing better patient-centered care? At the moment government money is provided to healthcare organizations with much more lenient standards on the efficacy of care given. Basically, organizations that are continually doing a poor job of putting patient’s first are still being kept afloat by government money. MACRA will push these organizations to either improve or yield to nearby healthcare all-stars. Sounds great, but I’m not interested. Like it or not, MACRA is coming and all providers will need to adapt in order to stay afloat. OK. So what should I do? Learn all you can! One thing that is recommended is to see if your organization can qualify as a PCMH (Patient Care Medical Home). This will help getting qualified as APM a lot easier and also carries some rewards of its own. Renown Health was the 1st provider in Nevada and the 4th in the country to adopt the PCMH model. Coffee, refrigeration, the internet. One constant throughout history is that people often fear change. Specifically, people fear the advent of new technology. People sometimes oppose innovation even when it seems to be in their best interest. Technologies that are vastly superior to their predecessors, or don’t have any predecessors, are more easily adopted. Resistance to new technologies comes from three key constituents, including the average consumer. Humans make decisions about new innovations with their gut rather than evidence. People flock to technologies that make them more autonomous and mobile. People typically don’t fear new technology, they fear the loss it will bring. Technologists often don’t think about the impact their inventions have on society. Innovation is not slow, linear or incremental — but the government doesn’t realize that. Looked at together, these reasons can be cited for the slow adoption of wider spread population health methods. Fortunately (like coffee, refrigeration, and the internet), we are starting to see these methods gain more and more favor. For more population health updates, follow me on Twitter @MarkBehl. With the arrival of the Zika virus in the United States, the nation and its medical organizations are mobilizing to prevent its spread. Integral to this process is sound population health practices. If you haven’t heard, the Zika virus is one of the biggest infectious diseases to roll into the states since the likes of West Nile and H1N1. Although the disease can be sexually transmitted, what’s more troubling is that it is known to spread via Aedes aegypti mosquitoes. At first glance, Zika doesn’t seem like that threatening of a harbinger. The initial symptoms of the virus are for all intents and purposes relatively innocuous: headache, muscle pain, fever, rash, conjunctivitis. In fact the symptoms are so mild that in many cases those infected with Zika are completely unaware of it. The thing is: it’s not those who are infected that are at risk. It’s their offspring. Zika is known to cause birth defects such as microcephaly, in the children of mother’s who’ve conducted the virus. The danger is not just for our generation, it’s for future ones. The United States government recently started putting funds towards combatting Zika. President Obama initially asked for $1.9 billion to combat the disease. The House of Representatives instead opted for a bill that wold send a meager $622 million, most of which is currently going to other Health Department like programs like those that are confronting ebola. The Senate’s package on the other hand proposes $1.1 billion, which will not only give the Health Department ample funds to educate and prepare Americans, but also will give the CDC the amount of funds they’re asking for research–research that includes the discovery of a vaccine. Today Dr. Tom Frieden of the CDC urged the nation’s officials to act and act soon: “We have a narrow window of opportunity to scale up effective Zika prevention measures, and that window of opportunity is closing.” But with the House and Senate empty during Memorial Day weekend holiday, the unofficial start of mosquito season, it looks like any action is to be delayed. For instance, in New York, Governor Andrew Cuomo has initiated a state-wide initiative to prepare for Zika. In addition to aggressively pursuing methods of staving off Zika by deploying mosquito traps and staying vigilant for any outbreaks, the state has put forth a number of initiatives that directly assist residents. Such as issuing Zika protection kits to pregnant women who recently traveled or lived outside the country. Of course the strength of population oriented health program is not just in having the care-providing agency (in this case government) provide aid itself; it’s in training individuals to be Zika-fighting agents on their own. In New York this is being seen in efforts that educate residents to reduce standing water, use larvicide tablets where standing water does exist, and assiduously utilize mosquito deterrents such as mosquito repellant. Most importantly, the state is asking residents to point out large outbreaks of mosquitos. Granted, it might be hard for the average person to figure out what a large outbreak is, in comparison to an average outbreak. But by putting out feelers, by activating more individuals to report data, the state is enacting the fundamentals of an effective population health campaign. New York is not alone in gearing up for the arrival of Zika. Bringing further aid, the CDC has made it possible for states and province to apply for additional funding to combat Zika locally. It doesn’t take that much of any eye-squinting to see how the fundamentals of the triple aim can been seen in the government’s mobilization against Zika. By educating people on the risks of Zika and empowering them with the means to prevent it, the government is using the research at their disposal (evidence-based knowledge) to spread preventive health services and behaviors. The more that the government learns about Zika, the more empowered it is to combat it–one of the reasons why additional funding for government agencies is so important. The ultimate boon here being a vaccine. Similarly to the first aim, this includes empowering citizens to take on Zika themselves. However that this just one point on the healthcare continuum. Under the the larger government’s guidance, we are seeing individual government agencies (like the CDC) collaborate, in addition to a number of private sector organizations (including Gilead Sciences Inc., Inovio Pharmaceuticals Inc., and Intrexon Corp. With the government’s oversight, these organizations are acting less in silo, and more as individual fingers of the same hand. An example of the sort of materials being circulated by government agencies, in this case the CDC, in order to educate. As idea of population health grows in popularity, we’re seeing more and more hospitals take health to the people. It’s not just enough to wait and see who comes. It’s a matter of going into the community. It’s about seeking an integrated, holistic and widespread approach. IBM Watson is one of the most exciting developments in population heath. It has an unprecedented capability for processing high volumes of data and turning that data into natural language answers. IBM Watson is like Siri on steroids. Through partnering with a number of organizations, IBM has been able to increase the range and power of the Watson. One of the most recent partnerships in this direction has been its partnership with ODH Inc. The progeny of this collaboration is called Mentrics. Mentrics gives Managed Care Organizations (MCOs) and Behavioral Health Organizations (BHOs) like Renown Health the ability to “understand the whole population, segment the population needing intervention AND manage and monitor the key determinants of health for each segment.” Not only will Mentrics give population health organizations more data to work with, it will make providing healthcare cheaper and more streamlined–specifically when targeting those segments that suffer from a chronic comorbidity. When patients have a physical and a comorbid (coinciding) mental health disorder, treatment becomes more costly and often less effective. For instance, a patient with diabetes and depression has a 200% higher mortality patient compared to a patient who only has diabetes. Furthermore, individuals with coronary artery disease and depression are 2 to 3 times more likely to incur a future cardiac event. Those who fall into this segment of comorbidity of chronic physical and mental health cost 300% more than those with only only chronic health condition. Bottom line: the greatest healthcare expenditures are going to a small group. We need a way of addressing this specific group. Big data, population health, and specifically Mentrics is the answer. Using 22 dimensions including a model for behavioral health specific risk stratification (the only commercially-available one on the market thanks to IBM Watson), Mentrics will be able to create clinically meaninful poplulation segments. Bottom line: This will help medical professionals to identify which segments will most likely benefit from interaction. With Mentrics, providers will be able to assess their own effectiveness and efficiency, allowing for a comprehensive comparing of providers and an analysis of the entire provider network. This will in turn work towards value-based payment arrangements. Bottom line: Money will be allocated more accurately, efficiently, and economically. Using a user-friendly, “Longitudinal Data Visualization tool”, cross-network providers will be able to notice detailed patterns in medication use and clinical history. Furthermore, providers will be able to receive notifications based on evidence-based care gaps like patients receiving duplicate prescriptions and providers will be able to customize cross-network care via these notifications. Bottom line: Providers will have a more holistic view of patients and will have an interoperable system in place for communicating with other providers. Years ago, population health was a vague though ambitious field. It promised an integrated cross-network system that optimized patient outcome and reduced patient cost. Yet, it seemed that there was no shortage of hurdles blocking population health from ever realizing its vision. But recent developments in digital health, such as Mentrics prove that there is indeed hope for an ubiquitous population health model. Mentrics provides providers with unprecedented awareness of the millions of variables that go into a healthcare system. Now it’s just a matter of this brilliant software finding its way into practice. At the center of modern population health practices is data. Traditional forms of gathering data include culling medical records, analyzing ever scrap of demographic information available, looking at medical studies conducted, and gleaning information from other people/systems/organizations that are compiling their own health databases. But the advent of smartphones and wearable apps allows a whole new sort of data collection. It allows access to real-time, uniquely tailored data for an individual, and at the same time (when enough individuals are using the app, mobile apps and wearables) allow access to lots and lots of numbers. Numbers that can change the landscape of population health for a community and for the world. Northwestern’s Intellicare app suite opens a new door into quickly and easily collecting data on mental health. From Apple’s Healthkit to Samsung’s SHealth, apps that help people measure their fitness activity and diet are becoming more and more popular. But we’re also seeing the emergence of a level of unprecedented apps, such as Northwestern University’s Intellicare app suite that focuses on mental health. Using a variety of approaches to treating mental health based on Cognitive Behavioral Therapy (CBT), the Intellicare suite holds the potential to provide data on mental health from a variety of patients. Although not a complete substitute for face-to-face interaction, the app suite grants patients an accessible and cheap first line of defense resource. Yet another a tool in the value-based healthcare model. Wearables adoption is set to double from from 2014 to 2019. A recent study in 2015 indicates that patients with multiple sclerosis were much more likely to engage in an activity tracking physical fitness with wearables. Over 24o patients enrolled in the study to track their activity with Fitbits and 77% made it all the way through to the post-study follow-up survey. For starters, wearables are cool. Just like it’s fashionable to have a smart phone, it’s fashionable to have a Fitbit. According to a survey conducted by RBC in 2015, Fitbits are one of the most in-demand wearables out there. Convergence between brands and tech e.g. UnderArmor acquring MyFitnessPal, etc. What are your thoughts on apps and wearables? Is there a particular company or product that you think is making strides? Let me know @MarkBehl.